There’s no sign of rain on the horizon (thankfully). But the soil is dry and the plants are suffering. How do you keep your garden green during summer? 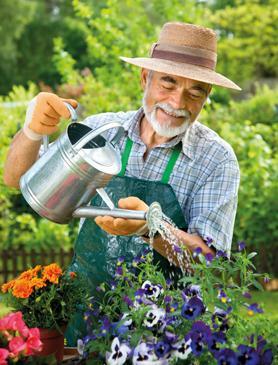 Apart from frequent watering, your plants also depend on soil fertility. When they draw strength from well-fertilised soil, plants can withstand the heat and dry weather better. During summer, fertilise the soil well using organic compost. This is also a good time to invest in a composter. If you’re composting dry grass, food leftovers and paper, keep them moist: this, combined with the summer heat, will help them rot quicker. When choosing plants, make sure that most of them are resistant to heat and have a hardy root system. Hardy perennials need less water to survive the hot Maltese summer. Moreover, instead of planting for one season at a time, you will be investing in the future of your garden. If you’re planting seedlings, give them some time to adapt to the sun. The best way is to shelter them with some net or leafy branches for a week or two – this will help them establish and become sun hardened. In summer, you will need to water more frequently. The best time to water is when the sun goes down because that way, water will not evaporate quickly. Also, dig a small channel around the plants or pile some dry grass around the base of every plant – this will help retain water around the plant. Potted plants, especially those in terracotta pots, can be vulnerable to overheating. One common solution is to keep potted plants in saucers of water – however, this might lead to root rot and mosquito breeding. A better option is to fill the saucers with fine soil and keep the soil moist. This will ensure that the roots stay cool and healthy.